It acknowledges that children’s safety is at the forefront of the provider's mind when they care for your child. There are no specific requirements for the number of paediatric first aid trained staff under Scotland’s Health and Social Care Standards. However these standards require sufficient individuals to be trained in paediatric first aid and to have the confidence to act in an emergency. 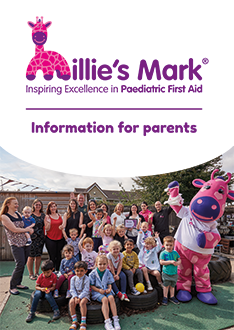 Millie's Mark will be awarded as a special endorsement to childcare providers that go above and beyond these minimum requirements by having 100% of staff trained in paediatric first aid, and also ensuring that everything learned during the course is kept alive and in the forefront of practitioners’ minds so that they are confident, ready and capable. Millie’s Mark is named after Millie Thompson, who died after choking on food at nursery in 2012 when she was just nine months old. Read more about Millie's legacy.